Streaming service Spotify has become the latest major web platform to find itself compelled to do something about oft-shirtless conspiracy theorist, lead-infused supplement peddler, and Infowars founder Alex Jones, removing several episodes of his podcast under policies against hate speech. 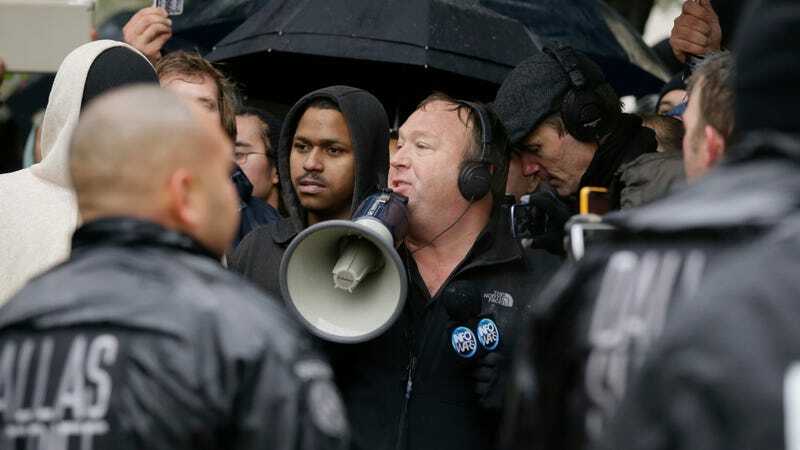 Attention to Jones’ presence on Spotify was first called by Jared Holt, a researcher for progressive site Right Wing Watch, who noted Jones has four podcasts there: The Alex Jones Show, RealNews with David Knight, War Room, and something called Infowars.com Freedom Nuggets. Holt noted numerous times where Jones’ content seemed in clear violation of Spotify rules. Those included appearances by white supremacists and members of hate groups on shows, hate speech against Muslims and LGBTQ people, threats of violence against special counsel Robert Mueller and perceived members of the “deep state,” and harassing survivors of mass shootings Jones has contorted himself into believing were false flag attacks orchestrated to advance a nefarious agenda. A Spotify spokesperson declined to share what episodes were removed or what specific content triggered the company’s action, but the podcast is still available through the service. Major tech platforms have historically been loathe to involve themselves in more than token efforts to police their vast networks of user-submitted content—and though many of them are stepping up their efforts to appear they’re doing something, the status quo essentially remains that the rules are full of loopholes and are often only arbitrarily enforced in response to external pressure. Jones is apparently somewhat closer to the brink on Facebook, which despite its mushy stance on misinformation and propaganda has confirmed his behavior has gotten him “close” to a total ban. But even the 30-day temporary suspension Facebook recently placed on his personal account that leaves other Infowars staff free to publish to their page has resulted in the usual griping from conservatives like Senator Ted Cruz. The site is more or less terrified of angering Republicans and is in the middle of a Heritage Foundation-led review of imaginary bias against conservatives, and there’s every reason to be wary they will cave. It’s not as though any of these platforms are specifically responsible for Jones—conspiracy theories aren’t new, and he’s been promoting them on radio for decades—but in general, their laissez-faire attitude towards letting him use their massive scale to reach attitudes has been the nitro to his jet fuel. It’s possible that will change, but if that fails to materialize, at least Jones is still embroiled in legal battles over defamation claims that could result in serious liability.